There are a few ways to search for titles in Marketplace, and several options for modifying your search results. You can use the Shop drop-down to search for titles in each lending model. Once you select a lending model, you'll see a search bar at the top of the page (except in the Simultaneous Use section). You can use the search bar to find a specific title, author, series, or publisher, or use the Advanced search to enter multiple criteria or browse a specific category (like award or rating). The Simultaneous Use section works a little differently. 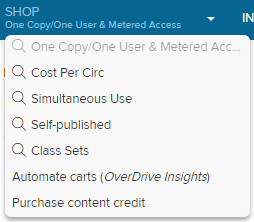 Before you search for any specific titles, you'll need to select an SU publisher. From there, you can use the "Search within results" bar or Advanced search (in the left sidebar) to find titles in that catalog. 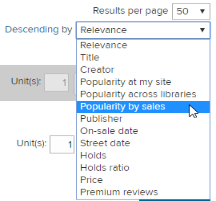 Sort your results by relevance, title, creator, popularity, on-sale date, price, and more, using the "Ascending/Descending" drop-down. Note: The Popularity at my site, Popularity across libraries, and Popularity by sales sort options refresh twice a week based on accumulated checkouts/holds or sales from the past ~90 days. Filter your results by your library's holdings, lending model, on-sale titles, format, weed status, premium reviews, audience, subject, publisher, language, reading levels, and more. After advanced searches, select the Edit search link to change your search criteria, then re-run or save your search.